Product prices and availability are accurate as of 2019-04-03 21:08:09 EDT and are subject to change. Any price and availability information displayed on http://www.amazon.com/ at the time of purchase will apply to the purchase of this product. The Canon PIXMA MX300 Office All-in-One Inkjet Printer lets you scan, fax, copy, and print photographs and documents with one easy machine. 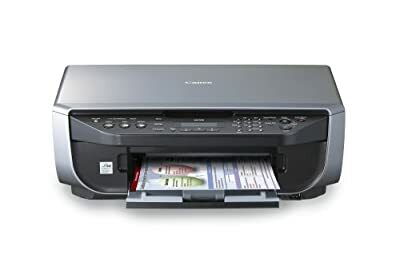 This all-in-one printer features a compact, streamlined design that can scan vivid images with color resolutions up to 4800 by 1200 dpi, copy images and documents, or print bold, laser-quality text or photos directly from memory cards, cameras, DV camcorders, or camera phones in seconds. The printer's Easy Scroll Wheel makes operation a breeze, and the Auto-Image Fix feature ensures that every photo is clear and vivid. With this PIXMA, you can even fax at Super G3 fax speed in color and black-and-white, and its memory can store 20 speed-dial codes and receive 50 incoming pages. Just press the Power button and get to work, thanks to the printer's helpful Quick Start design. Copies come out crisper than ever with the system's Dual Color Gamut Processing Technology. Compatible with Windows Vista, Windows XP, Windows 2000, and Mac OS X 10.2.8 to 10.4.x8 operating systems, this versatile printer comes backed by a 1-year limited manufacturer's warranty. Pixma MX300 all-in-one printer, cross sell sheet, easy setup instructions, quick start guide, setup software and user's guide CD-ROM, PG-40 black cartridge, CL-41 color cartridge, power cord, and telephone line cable.